Suppose you’ve just completed college. And suppose that you are a topper – that you’re in the top 5% of the graduates. Would you consider becoming a teacher? You should. For the sake of our children, you should. That, at least, is what McKinsey & Company suggest. About five years ago, McKinsey sought to find out why some schools succeed while others don’t. They did that by studying the school systems of 25 countries, including 10 of the top performers, to identify the common characteristics of high-performing school systems. Similarly, other countries that have great school systems also attract the best teachers. Finland, for example, attracts the top 10% of graduates. And Singapore and Hong Kong each attract the top 30% of their graduates. The quality of an education system cannot exceed the quality of its teachers. That’s right. So that’s why we should do more to encourage our best graduates to become teachers. That’s why we should – as suggested by McKinsey – get the right people to become teachers, train them well, and then enable them to teach. If we really want to improve our school system, we should get serious about attracting and then training and retaining the best possible teachers. That, unfortunately, is not the case right now. And the situation is about to get even worse. The RCSC has recently announced that, except for posts that require a teaching background, teachers will not be eligible to apply for other vacant positions in the government. Our schools need to attract the best of our graduates. But the best will not opt for teaching if they know that they will never be able to apply for other government posts. There’s no doubt that the RCSC’s rule is meant to address teacher shortage. But the rule is shortsighted – by preventing teachers from competing for other government positions, teaching is going to become even more unattractive and the best teachers will stay away from teaching in the first place. That will not be good for our schools. And that will not be good for our children. So the RCSC should rescind its rule. Teaching should be attractive. It should not be forced, even for teachers. Bonded teachers is not a good idea. The RCSC and the Education Ministry may wish to read McKinsey’s “How the world’s best-performing school systems come out on top” to understand why. Gakiling has only one school, a community primary school. It is in Rangtse, a small, impoverished village located four walking days from the nearest motor road in Haa. 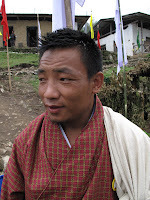 Tshering Dorji is its principal. In 2006, after teaching for about three years in remote schools in Samtse, Lopen Tshering volunteered to go to Rangtse to establish a community primary school. There he met enough children to start the school. And he saw a community eager to build their school. So together, they – farmers, children, and teacher – erected a two-room hut that would become Rangtse’s first classrooms. Early the following year, 38 children showed up for school. And Lopen Tshering got to work. He taught his students to read and to write, to sing and dance, and to work and play. His first students included a paraplegic and several toddlers in the “pre-school” section. 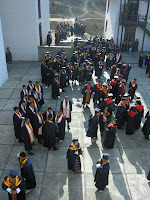 By the end of that year, the school had treated the public of Rangtse to their first ever cultural show. But that was not all: the principal took the show on the road, where his talented students entertained admiring crowds in Sombaykha and in Dorokha. Today Rangtse CPS has 97 students studying in classes PP through III, many coming from villages that have never had a child attend school. The school now has four teachers including the principal and his wife. And they have a few more huts, some of which are still being built. But that is still not enough. So all the teachers – the principal, his wife, and the two others – live in one room. That room is furnished with three beds and one cupboard. Lopen Tshering has shown how much can be achieved with so little. He’s built a school from scratch. A school that gives hope. And that provides the only opportunity to escape poverty. So today, on Teachers’ Day, I want to recognize the hard work that Lopen Tshering Dorji and his teacher friends have put into building Rangtse CPS. And I want to acknowledge the tremendous sacrifices that they have made. And thank them. I wish Lopen Tshering and his teacher-colleagues throughout our country: A very happy teachers’ day.